Following some bird call, I walk across the hanging deck bridge. Little by little, that woodpecker-like voice takes me ever further and yet, I see no bird. Finally, I sit on the bench by the Lazareva (Lazarus) River, in a limestone canyon sprinkled with all the colours of Saint Michael’s Summer. Wait, what is the Saint Michael’s Summer, you may ask yourself? It is the Serbian name for an Indian Summer, after Saint Michael’s Day, celebrated by the Orthodox Church on October 12. Along the opposite bank, a White-throated (European) Dipper (cover photo) is foraging in the shadow of the Lombardy Poplars. It is swimming with its body half-submerged (typical for the species and yet, so strange for songbirds) and often diving. 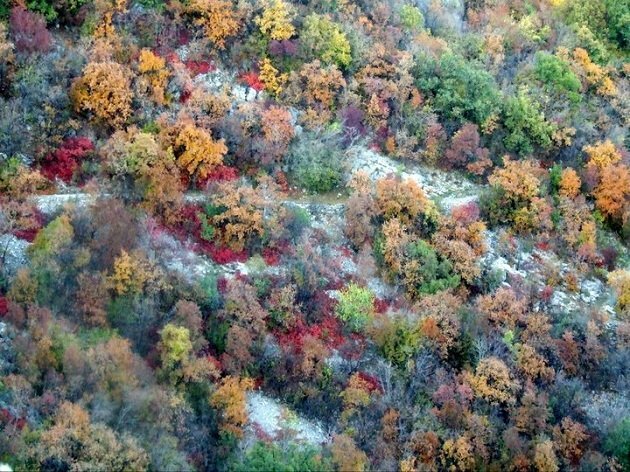 The colours of Saint Michael’s Summer in the Lazarev Canyon, (c) Jelena Nikolic Antonijevic. 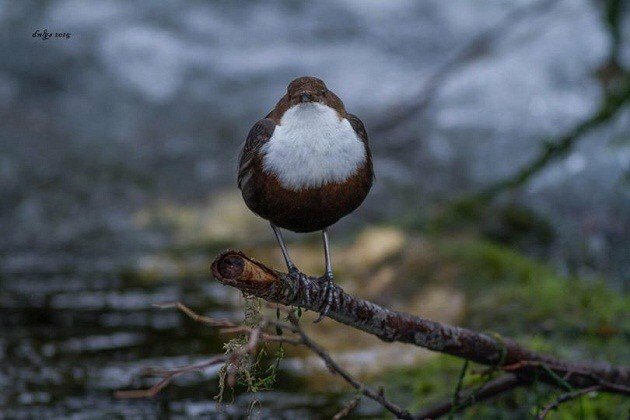 A long time ago, before I saw a dipper, I’ve read a description that stayed with me, the image chiseled in my mind: while it catches insect larvae underwater, air is coming out of its feathers and some bubbles remain attached to its body, creating an impression that it is covered in pearls. This species is reasonably easy to find if you are in the right kind of habitat – but I am rarely in that type of habitat. And in order to see the bubbles underwater, one needs to be right above the bird. I saw my first dipper some time later, in 1996 in the village of Stitkovo, where all the houses – with stone ground floor, wooden upper floors and slate roofs – were built in the 19th century or earlier. I was sitting on a low wall encircling a pond by the church when I heard a splash behind my back and then saw a dipper flying away. It was diving right behind me – it could not get any closer than that, and still, I haven’t seen it underwater! After that, I observed it quite a few times, but always like this, me on one bank and the bird on the opposite side. This dipper caught some longish, finger-like prey item and hit it against the protruded root several times – kingfisher-style – before swallowing. 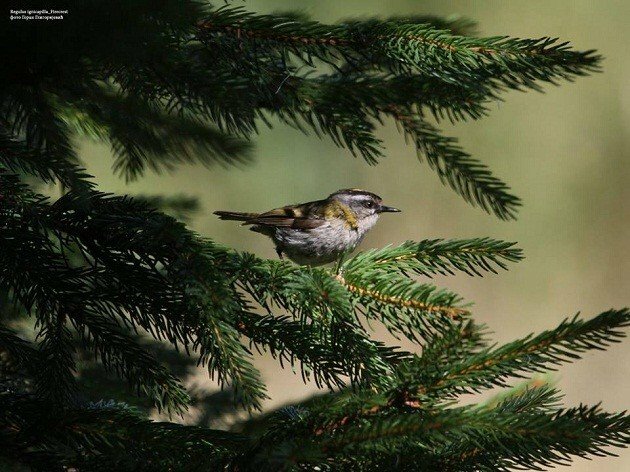 The Common Firecrest, (c) Goran Gligorijevic. The air was getting cooler, the shadows blanketing the canyon. One Common (Eurasian) Kingfisher flies low above water, then another dipper comes to land at my riverbank, but entirely hidden from view. One note from a tree above my head, a minute bird that I can barely see in the pine needles. I am following its movements through binoculars, and it is clearly a crest (a.k.a. a kinglet), but it could be a Goldcrest, or even a Firecrest. Which one? From one branch to another it goes, but always at the other side of a tree crown. And if I get up to walk to the other side, it would fly away. A woodpecker in flight, I can tell by the way it flies, but all I can see is a silhouette disappearing in sunset. At the opposite bank, a Eurasian Red Squirrel is checking the poplars, climbing each one for a metre or two, sniffing – I guess, and then jumping down to the next one. The crest is still jumping through pine needles. I mostly see its belly, sometimes the tail, perhaps the silhouette through the needles, but cannot get a view of the head. The dipper is a bit closer by now, checking some rocks by its bank, and then I turn my view back to the crest. This game lasted for a good 15 or 20 minutes, until I managed to see its head with black eye stripe, white supercilium and the black lateral crown-stripe: the Common Firecrest! That “fire” refers to the median crown-stripe, but that is something I could not see from underneath. Bats flying out of the Lazareva Cave, (c) Jovica Sjenicic. 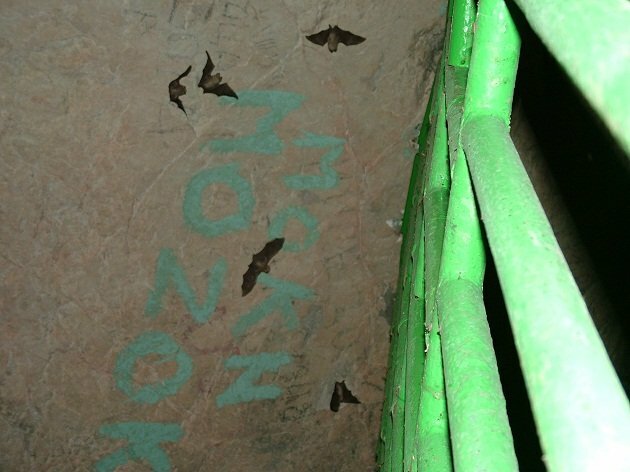 By now, the evening becomes chilly, so I join local cavers in the warmth of their container-bivouac with a bit of an overstatement of a name – “The Research Centre”, for a mug of coffee and a chance to observe a colony of bats flying out of the Lazareva Cave into the clear night sky of Saint Michael’s Summer.